B.Com LLB is Bachelor of commerce and Bachelor of legislative law integrated course offered by the board of OPJS. This is a five years course whereas the academic scheduled has been made classification with semester wise information. This is degree level education which will make the certification equal to under graduation which was certified with BCI Approved page. The required educational qualification for getting admission in OPJS for B.com LLB will be 10+2 or HSC from the concerned board with good academic results and pass certification should be issued by recognized board in any state. Students must have minimum subject knowledge in order to get appear from entrance exam for B.com LLB in OPJS. This is combined educational course which will offer by a few numbers of colleges or universities with purity and quality with best-experienced faculty. The instructions to conduct the exam for OPJS B.Com LLB will be considered by the guidelines given by the board of examination under state government. The maximum given duration for getting pass certification in all subjects will be 8 years and the candidates are allowed to write the final exams up to 8 years from starting years those who are failed to get appear at first or second attempt of exams conducted by the university board examination. Qualification: 10+2 or HSC from recognized board. Age limit: 16 to 24 years. Required pay of fee for applying law course will be similar to all streams in OPJS University such as below. Exam fee will be RS.1000 per year. Academic year fee of RS.35000 per year. The registration fee will be RS.1200 per year. There will be an availability of huge options for placing in recognized multinational companies or organization after gets passed in B.Com LLB BCI Certified education. The official notification of placement conducting program will get uploaded in authority portal with complete information which will make the students get awareness about latest news and events. Try your level best and put up to the mark giving your best in placements. OPJS offering B.A LLB course under the section of law with officially approved certification given by BCI which will more useful for choosing the better career. We are advising the candidates to go through BA LLB in OPJS located in the state of Rajasthan, to get admission for BA LLB in OPJS University, students need to apply through online mode by paying the registration fee. Along with exam fee and registration fee, management has been separately classified the fee for an entire academic year. University will conduct entrance admission test to make the analysis of students whether they are well suitable for the course which was chosen by them or not. Candidates need to clear the test by obtained good score in the exam. This is the combined course which includes BA as graduation level and LLB as post-graduation in law sector. At a single instant of time, candidates are going to get the certification with BCI approved title from BA LLB course which is going to issue by OPJS Examination board. This is very great and good opportunity for candidates those who want to make a tag with LLB under their names and those who are dreaming to get Law certificate from recognized board located in Rajasthan. Go through detailed course structure information and made it select for your career option. BCI certification has been given to the board of OPJS examination which is more valuable and useful at the time of applying for competitive exams and other government sector exams. Name of Course: BA LLB. The level of education: Under graduation. Eligible qualification: Higher education in any stream with first class marks. Master degree in physical education is one of the suggesting courses in Om ParkashJogender Singh University. All interested and eligible students and general candidates can choose M.P.E and choose the best as OPJS for good and quality education. M.P.E education course will be mingled with various subjects such as Research methodology and statistics, measurement and evaluation in physics, scientific principles of sports training, exercise physiology, Projects with the relevant subject and the practical session of courses. Similar exam syllabus with these subjects will get continue for every academic year, as the years passes the number of candidates attending for the exam will increase with the successful beginning. For every subject, total units will get under classification and assigned every year with various topics related to concern subject. Final exams will continue for the students in different exam centers located within the state of Rajasthan. At last, within the time of finishing the courses, seminar and project regarding assigned topic will be mandatory to present to score good marks in the exams. As paper 6, the Practical exam will schedule at the end of exam session which was structured by the board of OPJS Examination. Each subject examination will be allotted with specified code and differentiated with an individual name as paper 1, paper 2, 3,4, like that. Students those have been taken the admission for M.P.E in OPJS University should clear all subjects with a good academic percentage. As compared to other courses, the M.P.E certificate issued from OPJS institute is well recognizable and there is an opportunity to get more career paths in golden steps. We are referring the candidates to go through this course as post-graduation level and make the ending with pointed records. This is the educational course related to physics and will help the students to get perfect in order to gather the information about the physical study about the components and devices. Along with quality study in preferred course, the board of OPJS will give placement training to the students to make them settle in various best and top companies. This is the right option to prove every one career choosing the path and should try well and best to grow up in multinational companies through neat and good performance level. Exam: OPJS MPE Admission Exam 2017. Age limit:20 to 26 years. Exam fee: RS.1000 Per year. Academic fee: RS.35000 per year. Registration fee: RS.1200 per year. OPJS University Physical Education Department Information Click HereThis is the educational course related to physics and will help the students to get perfect in order to gather the information about the physical study about the components and devices. Along with quality study in preferred course, the board of OPJS will give placement training to the students to make them settle in various best and top companies. This is the right option to prove every one career choosing the path and should try well and best to grow up in multinational companies through neat and good performance level. OPJS university offering the miscellaneous course in all streams and Master of Arts (MA) is one among those provided courses. M.A is post graduation level of course which is allowed the students with degree level in first class pass percentage marks. Good knowledge in various subjects will gain through pursuing M.A Education in any stream under OPJS Authority. M.A Course includes counseling under post degree stage with administration interference. Students can select the subject in M.A depends on the course chosen in Degree level. There is no restriction to provide the relevant education in both degree and post degree, education. The necessary option is support and interest toward the subject. M.A in various sections such as Sanskrit, economics, history, commerce, physical education, computer application, Business administration, science, geography, Hindi and English literature, chemistry, and mathematics. From these departments of subjects, candidates can choose any one as per their interest and capability to study. The updated and official features built by the authority will make the board appear with good look and supposed to possess top name the state. Extra curriculum activities will be provided by the management during extra hours. M.A course comes with the department of commerce and management studies. To get admission in OPJS, candidates need to complete three years degree with good academic percentage and should meet with authority needs and standards. At the time of getting admission in the university, students need to submit all original certificates of SSC, HSC and latest issued memo of Degree course along with Caste, income certificates. Theory exam and practical exams will be conducted for the students separately with official declaration schedule. Desired qualification: Any degree in the available stream from the well-recognized board with good academic results. Required age:18 to 25 years are the limited age to apply for MA Course. OPJS (Om ParkashJogender Singh University) was established under the act 16 of 2013 made and promulgated on 2nd of August, 2013 by Hon’ble Governor of Rajasthan State. The overall environment of the university is conducive and constructive to education as it is far away from the humdrum, and the fret and fever of the modern life. It is one of the best Universities in India. We have state of art facilities of international standards. We have a very vast library stocked with thousands of books with an ample number of books relating to legal field as well as the status governed by the principles of law. The interdisciplinary nature of the departments as one of the major stimulus to teaching and learning. The eligible candidate can apply only by filling the form for regular courses. Top 10 Students will get 50% of fee relaxation who clear the entrance test. As we can see that OPJS University offers a variety of courses to its students from the different field; the courses have been approved by the Government of Rajasthan Act. As per law, Universities do not require AICTE approval. Only institutions which are affiliated to Universities require approval. As the OPJS University is a self-financed University, established by the State Act; thus it does not require any AICTE approval. Various courses have been approved by relevant and respective heads of department in the state.For instance, the Law courses have been approved by the Bar Council of India. OPJS (Om ParkashJogender Singh) University was established under the act 16 of 2013 made and promulgated on 2nd of August, 2013 by Hon’ble Governor of Rajasthan State. The overall environment of the university is conducive and constructive to education as it is far away from the humdrum, and the fret and fever of the modern life. It is a boon for Rajasthan and India too. 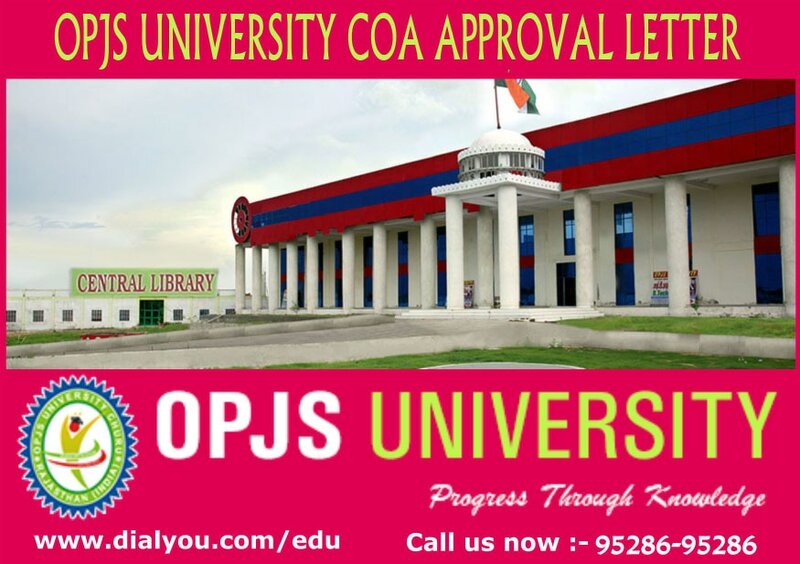 It is a private university and like central universities in India.OPJS is a well-known name for Ph.D. all over the India.OPJS offs a lot of regular courses from graduation to Ph.D. and M.Phil courses in all subjects. We have state of art facilities of international standards. We have a very vast library stocked with thousand books with an ample number of books relating to legal field as well as the status governed by the principles of law. The interdisciplinary type of the departments as a major stimulus to teaching and learning. OPJs University has been established under in 2013, under the State of Rajasthan Act, as a private university. The name of the university has been included in the list maintained by the UGC on its website www.ugc.ac.in. As per law, Universities do not need AICTE approval. Only institutions which are affiliated to Universities need approval from AICTE. As the OPJS University is a self-financed University, established by the State Act; thus it does not require any AICTE approval. Various courses have been approved by relevant and respective heads of department in the state. Teaching is the specialized course of knowledge and skills to provide unique and better service to the society to meet the educational needs of students. A good teacher facilitates positive qualities in students. According to the 2017 official notification of OPJS University, NCTE has approved various courses of education under the flag of Om ParkashJogenderSinghuniversity, Rajasthan. The duration of B.ed and ShikshaBhartib.ed is two years. The duration of B.A /BSc B.ed and B.El.Ed is four years. The minimum duration of D.El.Ed and D.P.S.E is two years. The duration of M.A lateral is one year and M.A education is two years. The duration of B.P.Ed, D.P.Ed, and M.P.E is two years. The duration for the bachelor of physical education is 3 years. The qualification required for the courses B.P.E, B.A / B.Sc.b.ed, D.P.Ed,B.El.ED, D.El.ED AND D.P.S.E is 12th. The qualification required for the courses of M.A education lateral and M.A education is the bachelor of education (B.ed). For the course of B.p.ed, the candidate must hold a degree of bachelor of sports. For B.ed the qualification of the candidate must be Bachelor of arts and for ShikshaShastriB.edthe qualification must be B.A with Sanskrit. The age of candidate applying for above course under NCTE must not be less than 16 years. No upper age limit is there for these courses. The fees for b.ed,ShikshaShastriB.ed, B.A/B.Sc.B.ed,B.El.ed,D.p.s.e, M.A lateral, M.Aeducation,m.p.e and b.p.e is 50000 rupees per year. Fees for B.p.ed, D.P.ed is 60000 rupees and forD.El.ed is 44000 rupees per year. The admission is based on entrance test and interview process. OPJS is one of the named and famed universities in Rajasthan. It offers the wide range of UG and PG courses to the students of the state. Thousands of students graduate from the university every year. One such PG course offered by OPJS is M. Sc Agriculture. The university will provide admissions into various courses to the students based on their performance in the entrance exam.The admissions are open right now and aspiring candidates can apply online for this course of M. Sc Agriculture. M.Sc Agriculture is a post graduate course in the scientific process of agriculture and agricultural studies. In order to do this PG course, the candidates should have completed their under graduation in B. Sc in Agriculture/Horticulture/Forestry from any recognized university. Candidates who completed the course successfully in the OPJS University will be provided with certification. M. Sc Agriculture is a two-year course of which there are many specializations. Students who have completed their degree in B. Sc need to appear for the entrance exam to get admission to this particular PG program. The course deals with scientific knowledge of agriculture and farming techniques and skills. Students specialized in M. Sc Agriculture can look for better opportunities in various fields. It is a course which specializes in 12 sub-disciplines. Duration of course: Two years and four semesters. Qualification: Bachelor’s degree in Agriculture or Horticulture or Forestry from a recognized university. The selection is purely based on the performance of the candidates in the entrance exam (70%) and academic record of the student (30%) in graduation. The placement at OPJS University helps the students a great deal in choosing a better career. Students will be placed into companies based on their marks in the academics and performance in the interview. COA stands for the council of architecture. COA is a national body driven by the government of India.This body monitors the registration of architects, education standards, and recognized qualification. The council of architecture regulates the education standard in the profession of architecture throughout India. Any student willing to carry the profession of architect must register himself under the flag of the council of architecture. For a person to practice as an architect must hold a certificate that is registered under the council of architecture with up to the date of renewals. In India, 484 institutions/universities are approved by the council of architecture running various courses of architecture. The approvals are only given on fulfilling the norms of the council of architecture. The requirements for eligibility for admission, course duration, the standard of staff and accommodation and the course content should be maintained by the institution. Om ParkashJogender Singh university, Rajasthan has been approved by the council of architecture to introduce five-year full-time bachelor of architecture (B.Arch.) degree.This is an undergraduate degree course.Students willing to build a bright career in the field of architecture can join the course in OPJS. The OPJS shall not admit any candidate in the very first year of the bachelor of architecture course which is a five-year course without affiliation of from state /central legislation. In this due course, OPJS must form the board of studies in architecture, building construction technology and interior designing under the faculty of architecture to deal with various issues coming in the course by 1/3rd of members of the practice. OPJS will create a separate board of studies in architecture and board of faculty of architecture for proper growth and development of this course. Visiting faculty must be drawn from practice to share up to 25 percent of teaching load. The candidate must ensure the affiliations and approval of university given on the university website.